We are so excited that Holly’s Quilt Cabin is helping us with our trip to Haiti to change 20 women’s life for the better by teaching them to sew to support their family. The Haitian women are mostly uneducated and are lucky to eat one meal a day of beans and rice. Our mission is to teach 20 women to sew on crank Singer Sewing machines to provide income for their playing with dollsfamily’s basic needs-food and wood to cook with. Electricity is available only a few times a week. These women will be given a microloan to start their business after their training. We taught 22 women last year to sew with this program. We will be teaching for two full weeks in Cap-Haitien, Haiti. 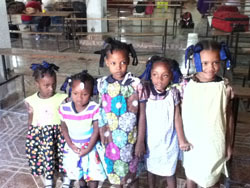 Our goal is 3,000 handmade dresses, 1000 tote bags, 1000 dolls, and 1000 boys shorts and pants. We are also taking boys and girls underwear and black shoes for school attendance. We have 3000 wooden cars for the boys. Boys shorts and pants can be store bought or used. We sew the third Tuesday of the month at Holly’s from 10am-4pm if you would like to come by and talk with us. Holly’s Quilt Cabin is the drop off location for all items. 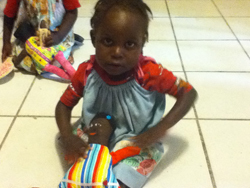 The Haiti Project sends a huge thank you to the Quilt Cabin Customers! 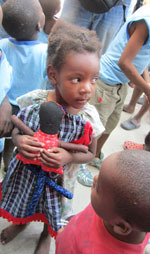 The Haiti relief effort gave out over 1200 dresses and 46 dolls. They fed 600 families for one week and 2 orphanages for about a month. 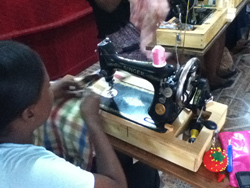 They taught 21 women to sew and gave them the sewing machine, sewing notions, and money to start a business. The goal for this next year is 3000 dresses and dolls.new dresses They also need boys shorts or gently used summer clothing. Sew notions for the sewing bags for each women is needed with new or used items. There were lots of naked children that should not be naked. The Haitian people are very loving and thankful. Giving a piece of hard candy is like giving a car to a 16 year old here. We are so thankful for your help. Holly’s Quilt Cabin made our trip successful.